Inscription: Inscribed in pencil, upperleft corner, recto mount: "Gust. Mathieu" Inscribed in ink, lower left corner, recto mount: "Gustave Mathieu"
Weary if not haggard, the poet and editor Gustave Mathieu looks out at the viewer with an expression made inscrutable by the cloud of moustache and beard that wholly obscure his mouth. His slight figure is nattily clothed in tartan vest, nubbly tweed trousers, dark jacket, and overcoat. The latter may have been desirable for warmth because at this period many of Nadar's portraits were made in the garden of his rue Saint-Lazare studio. Many of Nadar's sitters were already famous when he photographed them; others became well known later in their lives. Mathieu was neither; his birth and death dates are not known and, aside from this photograph, the remaining records of his life are slight. 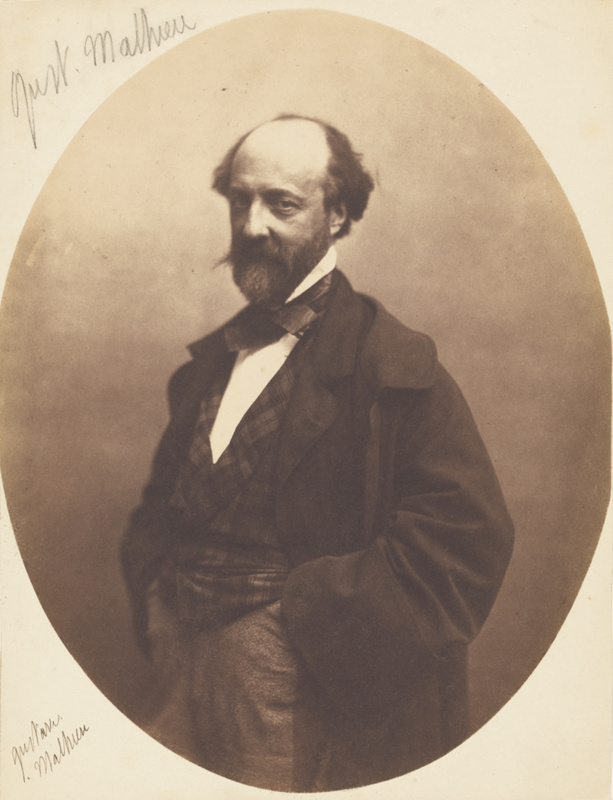 Mathieu may no longer be a recognized name, but the fact that this is a mounted edition print indicates that Nadar thought there was public interest in his image. Baldwin, Gordon, and Judith Keller. Nadar Warhol: Paris New York: Photography and Fame. Introduction by Richard Brilliant. (Los Angeles: J. Paul Getty Museum, 1999), p. 45.